A great price for a performance reel! Quantum Q-Vex Spinning Reels feature a quality 10-bearing system with anti-reverse clutch, tough graphite frame and sidecover, gunsmoke dual-anodized-aluminum spool, titanium nitride roller, and metal handle. ""This is a good spinning reel. It is smooth and reliable. 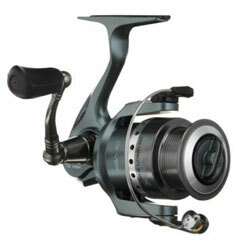 If you want a good reel and an excellent price point this is the reel for you." "this reel is awesome. ive never had a problem with it." "This product is the new best thing. Easy to retrieve and cast!"